What is the purpose of the Ladder Guard? There are some ladders that are either unsafe or need to be held off-limits to those who are either not trained or authorised to use them. The Ladder Guard protects others from a hazardous situation due to accessing one of those pieces of equipment that will either put them in harm’s way or is not for their use. It is a clear and distinct warning that this ladder is not to be used. Ladder Guards come in handy in warehouses, on construction sites and wherever a very long and potentially unstable ladder might be used or picked up to be transported to another location for use. 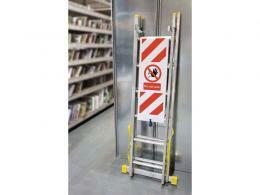 Storage facilities could be another place where such ladders may be housed as would storage and stock rooms. Construction workers will find the Ladder Guards are very helpful on the job as will warehouse foremen, house painters and even handymen. 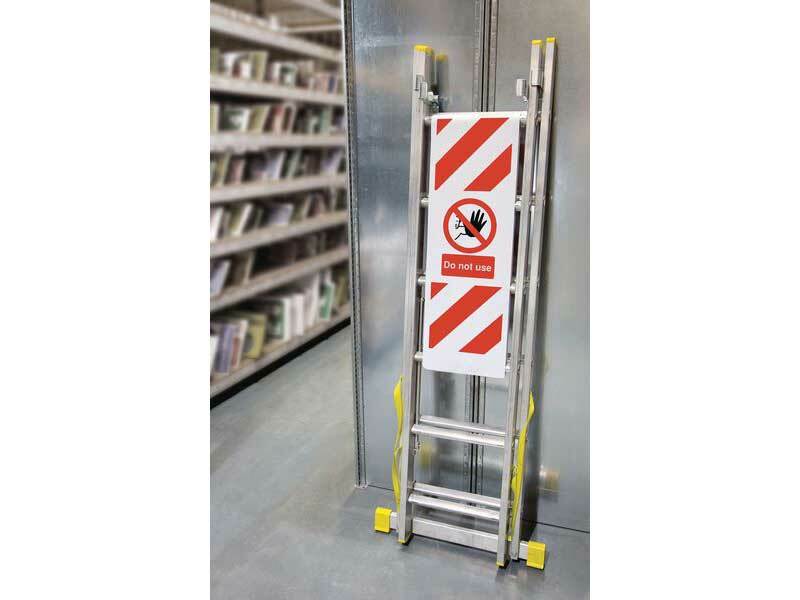 Maintenance workers that service a variety of job sites and office buildings will definitely see the benefit of keeping a Ladder Guard on hand to warn against unauthorised use of this kind of climbing equipment. This is a simple and easy to attach sign that covers up to 4 ladder rungs and rolls up so it can be stored easily and quickly. It is made of durable UV-resistant vinyl material and you can choose between two different fastening attachments. 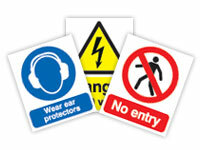 It comes in 2 different sizes and will be delivered to your site within 2-3 working days, free of charge. 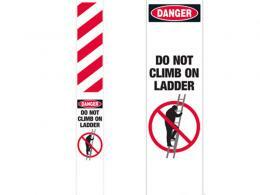 The Ladder Guard is eye-catching with its red and white striped warning design and the clear message of “Do Not Use.” It comes with a 1-year warranty and is perfect for preventing those work accidents that can often happen when people are moving too fast, wanting to get the job done quickly, and unaware that their choice of tool may not be the best for them or the work they want to get done. You’ll feel safer knowing you can clip this on and immediately announce the precaution to get someone to stop, look and listen.